Imagine reading a novel with the feel of one of Mystery’s best: you’re reading along, caught up in the plot, caring deeply about the protagonist, whom you hope can save his/her lover from impending doom while trying to penetrate the darkness of the mystery; perhaps you’re even feeling a bit awed by the author’s abilities -- when, suddenly, the protagonist whips out a flying carpet and rides it into his next gun fight. 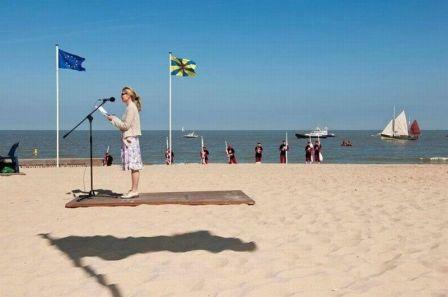 That flying carpet …. A bit startling isn’t it? All too often, when mystery writers attempt novels in which a protagonist is in the military, or is an ex-soldier – or when authors write a novel in which the mystery itself runs across an active battlefield, or up against a military situation -- I get startled in a very similar manner. In fact, I’ve been known to throw books at the wall, after I found myself driven to distraction by said authors’ obvious ignorance of military life, tactical necessity, and proper soldierly conduct. Now I’m sure more than one person reading this has just chuckled, thinking how inconsequential such items might seem when considered within the overall context of a novel. Unfortunately, however, these aspects ruin such novels for me, because my suspension of disbelief comes crashing down each time I read an offending passage. Thus, when I learned that two of my fellow Sleuth Sayers had published books with military ingredients mixed in, it was with some trepidation that I read them. Imagine my joy, when I discovered that they’d both gotten it RIGHT! And, that both novels were a joy to read: engaging, clever, well-plotted and suspenseful. David Edgerley Gates’ novel Black Traffic is a sprawling espionage story that opens during the closing days of World War Two, then continues and concludes in Cold War Berlin -- with action going down on both sides of the wall! In April,1945 Graf von Woldegk, a colonel in the Nazi intelligence apparatus, approaches members of the U.S. Office of Strategic Services, offering to turn over an established network of German agents (cover name: AUROCHS) working under deep cover within the Soviet Union, if the Americans will promise safe haven for those in the network and their families. Unfortunately for Woldegk, however, he’s been beaten to the punch by Reinhard Gehlen, a Nazi running another spy network against the Soviets. The OSS has already promised safe passage for the Gehlen Organization (one of many non-fictional elements in the novel) and their family members, and they figure one network is enough, so Woldegk is told to hit the bricks. Fast forward to Berlin in 1966. Army CID investigator Andy Wye is trying to find out who’s stealing large quantities of alcohol from the Army Class XI ration supply and selling it on the black market. His investigation takes an unexpected turn, however, when a man who is a suspected KGB-controlled operative pops up in the mix, and Andy begins hearing hints about a tie-in called AUROCHS. A particularly interesting note about Andy is that he’s a Spec-9 (which stands for Specialist 9). This means he draws Sergeant Major pay, but is NOT a Sergeant Major. The Army created the “Specialist” category of soldiers, in response to a problem: certain military jobs such as cook, radio operator, intelligence analyst, etc. relied on enlisted soldiers with experience. The army knew it needed these folks to reenlist, in order to hang onto that necessary experience. Thus, these jobs required room for promotion. After all, who wants to stick around in a dead-end job? Problem is: the soldiers who filled these positions were by-and-large not people who had ever led anyone. They had technical knowledge and technical experience, but no leadership experience. And the army didn’t quite trust them to effectively lead other soldiers; they wanted them to exercise their technical skills instead. It was that technical skills experience the army was paying to keep, after all, not leadership ability. On the other hand, Non-Commissioned Officers (Sergeants) do lead other people. So, the army assigned NCO’s to the units these soldiers were in, in order to provide much-needed leadership. At the same time, however, the army also needed a way to promote technicians to higher pay-grades (E-4 through E-9), without promoting them above the authority level of their NCO leadership. The solution was the creation of the “Specialist”: a soldier who does not have leadership authority, but can work his way up the pay grade ladder anyway. Thus, Andy doesn’t have any of the command authority that would normally come with his pay grade. Nor, to an extent, does he get the respect that a Sergeant Major would enjoy. Instead, he’s worked his way up through the ranks, to a well-paying position, with a lot of perks, but he’s not really in charge of anyone. On the other hand, he has a lot of power when it comes to managing a criminal investigation. Gates’ decision to make Andy Wye a high-level Specialist is a stroke of pure brilliance in my opinion. I can think of a very successful mystery series that I can’t stand to read, because the protagonist is an ex-CID officer, but the author clearly has NO IDEA what Army CID personnel actually do, or how soldiers behave. And this is frustrating to me, because the plotlines, the characterization, and the tone are -- otherwise -- rather appealing (judging from the two books I’ve beaten against my walls). To explain: CID stands for Criminal Investigation Division. Army CID is extremely similar in operational nature to a detective bureau in a municipal or state police agency. CID personnel investigate crimes that occur on military installations, or -- in certain, very limited instances -- crimes that occur off-post, but involve military personnel. Given: CID personnel are federally sworn, because they operate for a department of the federal government, but they are not FBI agents. And, the CID guys I’ve met never tried to claim they were. When it comes to combating espionage, however, this work is performed not by CID, but by CI: Counterintelligence. Army CI is subordinate to the Military Intelligence Branch, while CID is subordinate to the Army’s Military Police Branch. And almost never the twain doth meet … partly because the two jobs require different types of procedures, and -- of necessity -- are governed by very different rules of conduct. Only in extraordinary circumstances would the two elements work together. Thus, not only this protagonist’s experience, but also his behavior, was very improper, given the type of officer he was supposed to have been. I found him just as difficult to believe, as I would if I were to read about two police patrolmen who were widely respected, honest and efficient, and who then went to arrest a suspect and -- after cuffing him -- raided his liquor cabinet and got drunk while watching TV wrestling in his living room, leaving the suspect to lie on the floor at their feet. This behavior wouldn’t match the character aspects the two cops are supposed to have. I can believe they’re respected, honest and efficient, or I can believe that they’re bad cops who raid the liquor cabinet, get drunk and watch wrestling when arresting a suspect – but I CAN’T believe BOTH at the same time. Just one more thing, ma'am.. I met probably a half-dozen CID or ex-CID soldiers, during my time in service. From what those guys told me, most CID personnel are enlisted folks; not officers. Which makes sense to me, because there are far more enlisted slots in the army than there are officer slots. Yet, authors sometimes seem to love casting their characters as officers. So, the protagonist of Black Traffic being an enlisted man was like a breath of fresh air. Honest air. And, it also added a layer of detail and complication to the plotline. Andy is an E-9, but he works for a First Sergeant. A First Sergeant is an E-8, one pay grade below Andy’s. But, the First Sergeant (sometimes called a “First Shirt”) is an NCO. He has leadership authority, while Andy is a Specialist and thus has none. This is why Andy works for the First Sergeant, even though he makes more money than his boss does. Also, because he’s an E-9, people like myself immediately understand that Andy probably has a couple decades of experience, that he started out as a regular MP but was promoted quickly and reassigned to CID during his second or third enlistment, and that he’s quite intelligent, is a good soldier who does his duty, and has closed many successful cases. Otherwise, he wouldn’t be an E-9; he’d be a retired E-7 or E-8. That’s the way the system works. The thing is: the First Shirt has the authority to pull Andy off a case. And, once CIA and British MI6 get involved, after that probable KGB-controlled guy pops up, that’s just what he wants to do. Andy, on the other hand -- though he has no authority -- does have a lot of unofficial weight he can lob around, because he’s an E-9. Plus, he’s got a lot of experience that the First Shirt ignores at his own peril. Andy doesn’t want to give up the case. To stay on it, he tells the First Shirt that he wants to find out who’s stealing government property and selling it on the black market. His argument is that he’s not interfering with an intelligence operation; he’s working to plug an illegal leak in the army’s supply chain. Beginning to see what I mean about added layers and complications? CIA -- at least, at first -- is happy to use Andy as a cat’s paw, letting him work his criminal case, because the criminal aspect is one of the few threads of the mystery that anyone can pull on to unravel the espionage knot lying hidden at the heart of things. MI6, however, is not so sure they want that knot unraveled. And, before it’s over KGB, GRU, and East and West German police and intelligence agencies will begin muddying the waters for their own reasons. Some find it advantageous to help Andy, or at least not to hinder his efforts, while others will stop at nothing -- including murder -- to keep him from succeeding. All of this goes on in a richly drawn, well explained world of the military and intelligence communities of that time, grafted onto then-existing real-life German cultural norms in Berlin, while Gates seamlessly weaves history, such as the Gehlen organization, into the fictional plotline of his story. In fact, this “procedural” aspect, coupled with the historical inclusions, are highly reminiscent of the best of John le Carré. Meanwhile, David Edgerley Gates also gives us a prose that’s filled with the true to life vernacular of army soldiers -- much of it uproariously funny. And, he’s careful to keep to the straight and narrow, so that his characters remain soldiers if they’re soldiers, and spooks if they’re spooks. Though it’s impossible to predict what anyone is going to do next (and surprises abound! ), nobody does something that flies against what might logically be expected of a person who was actually working that job in that place at that time – thought some do push the envelope. In fact, the way he handles the military and intelligence aspects of the book remind me of some of best-selling author W.E.B. Griffin’s best works. I bought a lot of Griffin’s books when I was in the army, purchasing many at my local PX stores. I read and loved them, but they tend to be about military or police life and aren’t necessarily everybody’s cup of tea. I believe Black Traffic, however, would not only do well at military exchange stores, I think it is a book that deserves to be read by anyone who enjoys well told espionage tales that reveal many of the complex procedures involved. It’s one of those rare works that is ‘gritty’ yet doesn’t leave a reader feeling soiled by what he’s read. And, I downloaded my copy from Amazon, so I didn’t even have to drive across town to buy it. Book sounds great. Thanks for explaining specialists. I read enough gov docs to wonder what that term meant, but have been too lazy to find out. Sometime i would like to know what you think of Martin Limon's books about CID investigators in Korea in the 70s. I think his officers both hold the rank of sergeant? You always make the technical and the mundane seem interesting. Thank you! I've been watching reruns of Murder She Wrote and the weakest IMHO are those involving British and US intelligence. The backgrounds and stories seem fuzzy and stretched to the limits of credibility. This helps explain why. Well done, Dixon and David! Your explanation of specialists is much clearer and more succinct than that of another description I remember, possibly from The General's Daughter. I used to hang around a number of Coast Guard guys and it seemed everyone was a captain, even if they happened to be a lawyer or in some other 'professional' job. Now you have me wondering how they sorted out those levels. Rob, is Martin Limon the writer who published short stories on the same subject in EQMM? If so, I thought his work was very good. I’ll have to check out his books. Anonymous: you’re welcome. However, I’d like to point out that Black Traffic is absolutely not mundane. It’s quite exciting! James Lincoln Warren, friend of the blog and an old navy man has helped me with captain questions, quite recently too. dix, yes Limon writes stories and novels about Sergeants Sueno (should be a tilda on that n) and Bascom. Best to read the books in order. Dix, I read Gate's BLACK TRAFFIC a couple of weeks ago and enjoyed it very much. In the 90's, our son-in-law was a warrant officer in Army CID, and had previously been enlisted personnel in the same agency. I had heard that in order to avoid any problems with hierarchy, the CID agents did not usually state their actual rank to those they were interviewing or interrogating. That’s my understanding, too, RT. I believe they operate under rules similar to interrogators and CI personnel, when it comes to uniform insignia.